A 44-year-old female without significant medical history presented to the emergency room with swelling and moderate pain in right suprapubic and inguinal area for past 2 days. The swelling was present for several years and did not cause any discomfort. Physical examination revealed a 5- to 7-cm tender fluctuant mass in the right inguinal and suprapubic region without signs of inflammation. No symptoms of bowel obstruction or other intraabdominal disease were present. 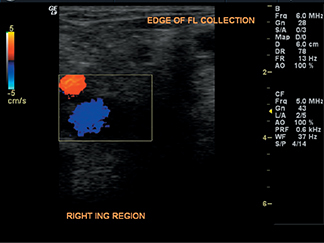 Ultrasound examination of the inguinal mass was performed (Figure 1-3). 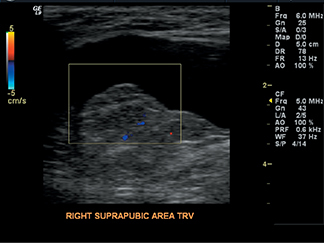 Sonography of the right inguinal and suprapubic regions with 6 and 4 MHz transducers showed an irregularly shaped elongated anechoic 6.5 × 4.3 × 3.1 cm fluid collection located medial to the femoral vessels. There was no communication with the peritoneal cavity, nor did the cystic structure change its shape with Valsalva maneuver. The appearance was not characteristic for bowel. Normal blood flow was demonstrated in the adjacent soft tissues on Doppler interrogation. The cystic structure was aspirated in the emergency department and approximately 7 cc of amber-colored fluid was obtained. Microscopic analysis revealed no cells or microorganisms. Female hydrocele, also known as encysted hydrocele of canal of Nuck, is a rare condition with only about 400 reported cases.1 The processus vaginalis peritonei (called canal of Nuck in the female) is a tubular fold of peritoneum that invaginates into the inguinal canal anterior to the gubernaculum and descending testis, forming the tunica vaginalis testis in male. The upper part usually closes at or just before birth and obliteration proceeds gradually in a downward direction, leaving the scrotal portion patent in the male. In the female, the entire processus vaginalis normally becomes obliterated.3 If it remains completely patent, it forms a path for indirect inguinal hernia. Partial proximal obliteration, which leaves the the distal portion of processus vaginalis open, creates the anatomic prerequisite for hydrocele of the spermatic cord in the male and cyst of canal of Nuck in female. The treatment of hydrocele of canal of Nuck is complete surgical excision of the hydrocele. Due to high association with indirect inguinal hernia, dissection to the internal inguinal ring and ligation of the neck of the processus vaginalis should be performed.5 Surgical resection of hydrocele is curative, as opposed to aspiration, which often results in recurrence. Hydrocele of canal of Nuck, the female counterpart of hydrocele of the spermatic cord, is a rare cause of inguinal swelling in women. Sonography, in particular its “real-time” nature and ability to precisely depict superficial structures, has high utility in narrowing the differential. The treatment of choice is surgical resection. Stickel WH, Manner M. Female hydrocele (Cyst of Canal of Nuck). J Ultrasound Med.2004;23:429-432. Park SJ, Lee HK, Hong HS, et al. Hydrocele of canal of Nuck in a girl: Ultrasound and MR appearance. Br J Radiology. 2004;77:243-244. Shadbolt CL, Heinze SB, Dietrich RB. Imaging of groin masses: Inguinal anatomy and pathological conditions revisited. RadioGraphics. 2001;21:S261-S271. Schneider CA, Festa S, Spillert CR, Bruce CJ, Lazaro EJ. Hydrocele of canal of Nuck. NJ Med. 1994;91(1):37-38. Anderson CC, Broadie TA, Mackey JE, Kopecky KK. 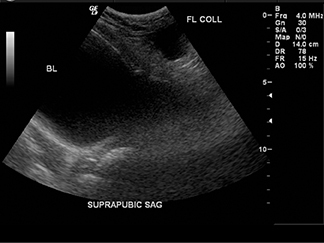 Hydrocele of the canal of Nuck: Ultrasound appearance. Am Surg. 1995;61(11):959-961. Radiological Case: Hydrocele of canal of Nuck. Appl Radiol. Prepared by Drs. Poghosyan, Panzegrau, and Ackerman while at The Medical University of South Carolina, Charleston, SC.